It’s no wonder clematis is called “Queen of the Vines.” There are over 250 varieties of the woody vine, offering blossoms in colors ranging from purple to mauve to cream. You can select a clematis cultivar with tiny flowers only ¼ inch across or opt for one offering huge, 10-inch diameter blossoms. 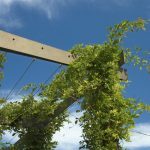 This versatile flowering vine can provide quick and beautiful ground cover, but it can also climb up almost anything, including trellises, garden walls, pergolas, poles or trees. All you need to do is learn how to train a clematis to climb. Read on for information about training clematis vines. Some vines climb by wrapping tightly twining stems or aerial roots around supports. Not clematis. If you want to know how to train a clematis to climb, first understand their climbing mechanism. Clematis manage to climb trees and poles by twining their leaf petiole around appropriately sized support structures. The petioles are not large enough to wrap around thick objects. 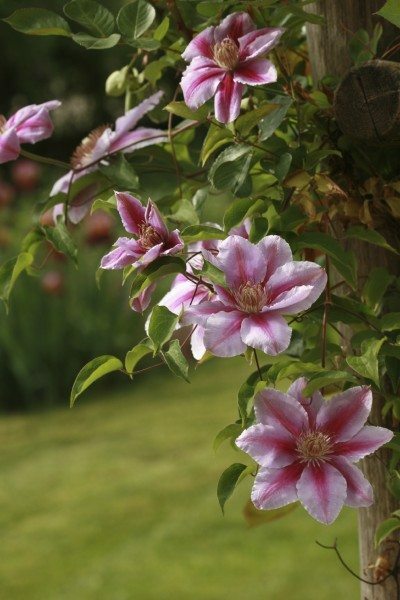 Experts suggest that support structures with a diameter of ¾ inch or less are ideal for growing clematis on a pole or wall. If your plans include growing clematis on a pole or similar structure, consider using thick fishing line to provide support for the plant. 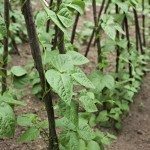 The plant usually is sold with a small pole holding up the vine. Leave that pole in place as you position the plant in the soil near the base of the pole. Attach the fishing line so that it runs up the pole. If you use fishing line to provide support for clematis, knot the line every foot or so. These knots prevent the vine from slipping down the line. Fishing line also works for clematis growing on trees. Trees are a special case when it comes to organizing support for clematis. The bark itself can provide the grip-holds clematis requires. Select a species of tree with rough bark for best results, like an oak. You may still want to add fishing line to provide more grips. Consider planting another vine on the tree in addition to the clematis. Ivy or similar plants climb on their own and can provide excellent support for clematis growing on trees.